☑Comfortable & Breathable - The luxury mattress topper is as breathable as clouds so that it perfectly reduces mold and mildew.Makes you feel super comfortable without extra heat and sweat and enjoy a good night sleep everyday. 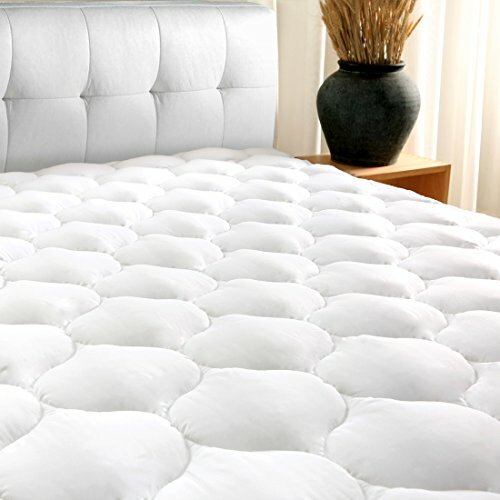 ☑Perfect Protection - Protects your mattress from pets, stains, perspiration, dust mites and other potential allergens. ☑High-quality Materials - Made of 100% 300TC cotton, 62 oz high-quality combed cotton, 83GSM standing polyester, 130GSM pocket with single-track elastic. Makes your mattress last a long time. ☑Fits matress up to 21" - King 78"X80" The fabric sides easily stretch to fit mattresses up to 21 inches thick. It will never slide no matter how you twist and turn in your bed. ☑Easy TO Clean - Machine washable.Tumble dry on low. Customer satisfaction is our priority, we provide money back guarantee if you are not 100% satisfied.